SOCIAL ARTIST Robbie Conal with Orion Owen at the Craft & Folk Art Museum last month. The following museums, libraries and bookstore offer programs where kids and teens can learn, explore and grow. CraftLab Workshops are offered on a drop-in basis for the whole family utilizing exhibits as inspiration for arts and crafts projects. Folk Art Everywhere and other programs invite local artists to share their methods and teach youth to create works of their own. Art classes for teens and kids using 3D models, sculpture, experimenting with color or telling a story are some of the classes LACMA offers. Teens can sign up for classes on bookmaking, science drawing, costumed-figure drawing, making a movie with a mobile device and building an art portfolio. Kids of all ages can meet a saber-tooth cat and her kitten Nibbles at the “Ice Age Encounters” puppet show. Live performances featuring the pair are Wednesdays at 10:30 a.m., 11:30 a.m, and 1:30 p.m. Saturdays at 11 a.m., 12:30 p.m. and 1:45 p.m. Teens 16 years and older who have a yen for paleontology can sign up to volunteer at the Fishbowl Lab where paleontologists work on restoring fossils. Car-theme story times with LA BookPALS and drop-in arts and crafts activities are available for kids visiting the Petersen Automotive Museum’s Discover Center. The center also has hands-on interactive displays for kids to learn the science and art of the automobile. Summer camps for kids ages 6 to 12 are also available for budding car enthusiasts. 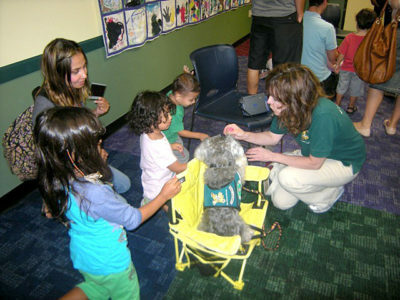 THERAPY animals from Love on 4 Paws recently paid a visit to young patrons of the Zimmer Children’s Museum. Kids learn about the environment, cultural sensitivity and community responsibility through art projects like making paper with recycled materials, creating hats for hospital kids and constructing such items as noisemakers and masks while learning about Purim and Mardi Gras. Baby and preschooler story times are Wednesday morning activities at the Fairfax branch. 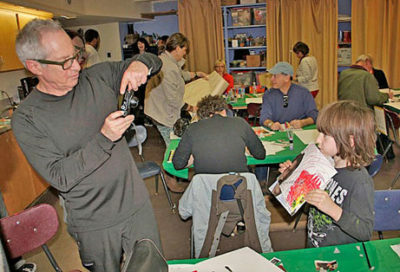 Kids ages five to 12 can take art classes taught by artists from LACMA on Wednesday afternoons. Teens can participate in one of the monthly art activities, Student Smart and a council meeting to discuss books, music and movies. Barnes and Noble at the Grove hosts a toddler story time on Wednesday mornings at 10 a.m.
Puppet shows, magicians, crafts programs and face painting are some of the on-going activities during the year at Farmers Market.